The new adidas +Teamgeist introduces a radically new 14-panel configuration reducing the amount of three-panel touch points by 60% and the total length of the panel lines by over 15%, forming a smooth and perfectly round exterior allowing players significant improvements in accuracy and control. 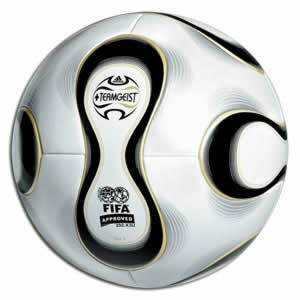 The Match Ball is designed in white and black, the traditional colors of the German national football team, and accentuated with the golden color of the FIFA World Cup trophy. Its name, ‘+Teamgeist’, is based on the single most decisive characteristic every team needs to have in order to lift the trophy: team spirit! Bigfoot : Fantasi atau Realiti..